While riding home after a day out on his Harley Davidson Ultra Glide, a car pulled out of a junction in front of Willie Newall and his friend, who was also on a Harley. “My mate collided with the tail end of the car so I immediately took evasive action,” explains Willie. 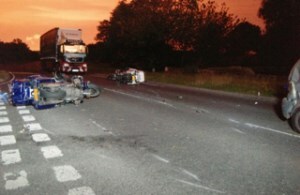 “Somehow, I managed to avoid my mate and his pillion passenger, his bike and the car involved. "However, my bike was written off and my wife Doreen, who was my pillion passenger, broke her finger, while I suffered various soft tissue injuries and cracked ribs, and there was considerable damage to our bike gear. “When I contacted my insurance company, they offered to put me in touch with a lawyer. I didn’t think I needed this as I assumed the insurance company would look after any legal issues for me but my local Harley Davidson dealer suggested I contact Brenda Mitchell at Motorcycle Law Scotland. “After my first phone call to Brenda, it was a no-brainer! “From then on, Brenda looked after my claim for my bike and my personal injury case. “I received regular phone calls, followed by letters, from Brenda, who kept me abreast of developments and always answered my calls or called me straight back if I left a message. Brenda was incredibly approachable and it definitely helped that she’s also a motorcyclist as I didn’t have to keep explaining what had happened or how. “My case was resolved as quickly as possible, even though the other insurance company tried to drag its heels - Brenda was like a wee terrier! In fact, it was all resolved, in my favour, within five months of the accident, which I was very pleased with.